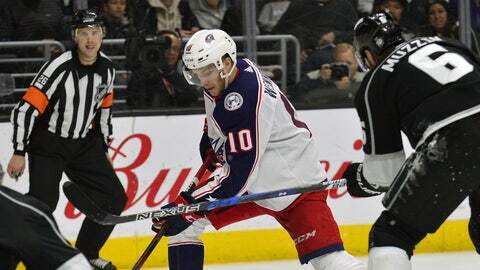 LOS ANGELES (AP) — Dustin Brown had a goal and two assists, Jack Campbell made 26 saves and the Los Angeles Kings got just their second win in the last nine games with a 4-1 victory over the Columbus Blue Jackets on Saturday night. The Kings led 2-1 in the third period when they put the game away with a pair of short-handed goals 57 seconds apart. Anze Kopitar got his own rebound and went top shelf on Sergei Bobrovsky at 7:46 for the right wing’s fourth goal of the season. Brown put it away less than a minute later on a penalty shot, which was Los Angeles’ first of the year. Alex Iafallo and Jeff Carter also scored for the Kings, who are 4-0 when scoring three or more goals. Zach Werenski had the Blue Jackets’ lone goal and Sergei Bobrovsky made 25 saves. Iafallo put Los Angeles on the board first with his third. The left wing’s shot from the left faceoff circle trickled underneath Bobrovsky’s pads. It is the first time in six games (Oct. 18 against the Islanders) the Kings scored in the first period. The Kings went up by two on a power-play goal in the second period when Carter took a cross-ice pass from Ilya Kovalchuk and fired a wrist shot for his fourth. Werenski scored for Columbus 29 seconds into the third when he beat Campbell after getting a centering pass from Boone Jenner. NOTES: Kovalchuk has two goals and four assists over the past three games. … Kopitar also extended his point streak to three straight and has a goal and two assists in that span. … Los Angeles’ Matt Luff made his NHL debut. The 21-year old right wing was on the third line. He is the first player in franchise history to wear number 64. … Columbus has scored a goal in the first period in 10 straight games. According to the Elias Sports Bureau that is three games shy of the franchise record. … RW Josh Anderson, who also assisted on Warenski’s goal, has a point in three straight games (two goals, one assist). Blue Jackets: Conclude their California swing at Anaheim on Sunday. Kings: Host Anaheim on Tuesday in the first Freeway Series matchup of the season.